Released in 2006, here’s what AllMusic.com has to say about Ordinary World: A lot has gone down in the Get Set Go camp since the release of their 2003 debut, So You’ve Ruined Your Life. First off, except for leader Mike TV, the entire band has been overhauled. And most serious of all,TV battled a serious drug addiction during the interim period. 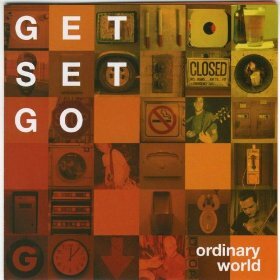 As a result, Get Set Go‘s sophomore full-length effort, Ordinary World, is an incredibly introspective record, as TV has opted to go the “autobiographical route” in his lyrics (especially when he talks about “smoking black” on “Get Thru the Day” and “drinking Drano” on “Suicide”). Also, Get Set Go opt to forgo the pop-punk sound of their debut in favor of more stripped-down, mostly acoustic-based approaches (akin to their heroes, the Violent Femmes). But TV‘s wit, quirkiness, and snappy melodies are all still present (along with his often warbling vocals), as evidenced on such tracks as “I Hate Everyone” and “Lift Me Up.” Sometimes it takes a band several releases to mature musically and take a bold step. In Get Set Go‘s case, it took two albums, three years, and as reflected in the majority of the songs’ lyrics, a lot of hard living.